Can't stream our own .mp4 videos? Why won't our own .mp4 files play through VOD? We have been using the default VOD application, and just inserting our videos into the content folder, and replacing the sample.mp4 text with our own .mp4's in SimpleVideoStreaming/Client. We lowered the FPS and the bitrate on our encoder, and still no good. Our encoder is doing true .mp4 and not just converting or renaming the file. Also, our codecs match up with the sample.mp4 codecs, so I don't understand what the issue is. It sounds like your .mp4 files are in the correct location for use with the provided application named 'vod. What do you see in the [install-dir]/logs/wowzamediaserver_access.log file? It should provide some clues as to why the video does not play. Are you able to play the provided sample video, sample.mp4? Yep, this is the way we are doing it. Here is the log, I first tried to play our .mp4, and than I played the sample.mp4 which works. Otherwise, the file may be corrupt. Does it play in vlc if you open the file directly? FLV isn't doing anything... With my mp4 or the sample.mp4, just sits at the white screen as if I didn't even click play. VLC is playing our videos fine. Here is an image of our codec comparison. Ours is on the left, and the wowza sample is on the right. 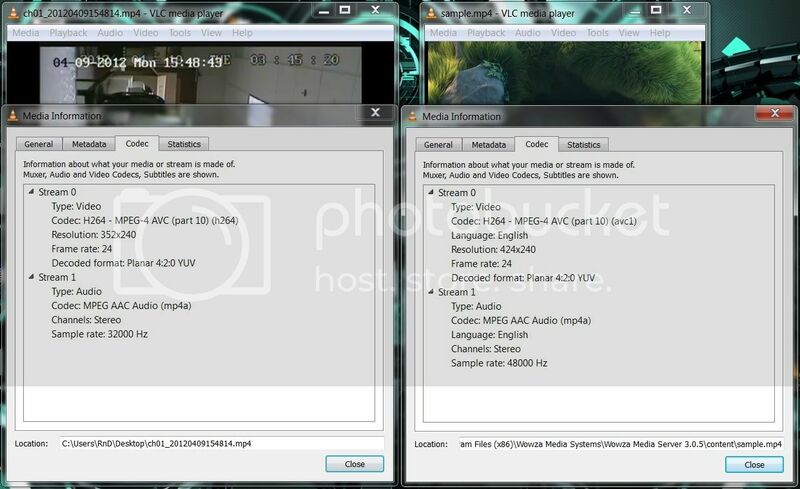 Only difference I see is H264 vs (AVC1) but would that make a difference? The video looks okay. Can't hurt to try 48000Hz audio sample rate. Have you seen these encoding suggestions for Expression 4 and FFmpeg? If that doesn't help, copy a sample to your web server and send a link to download it to support@wowza.com. Tell us what encoder you are using and detail settings.